Derelict Commercial Vessel Removal - Global Diving & Salvage, Inc.
Goble, OR lies on the Columbia River approximately 70 nautical miles from the Pacific Ocean, and the area surrounding the site provides critical habitat to salmon, osprey and numerous other species of birds, fish and mammals. The Columbia is the largest river in the Pacific Northwest, vital to fishing, shipping and recreation; an environmental disaster on the waterway would have a substantial ecological, economic and cultural impact on the area. 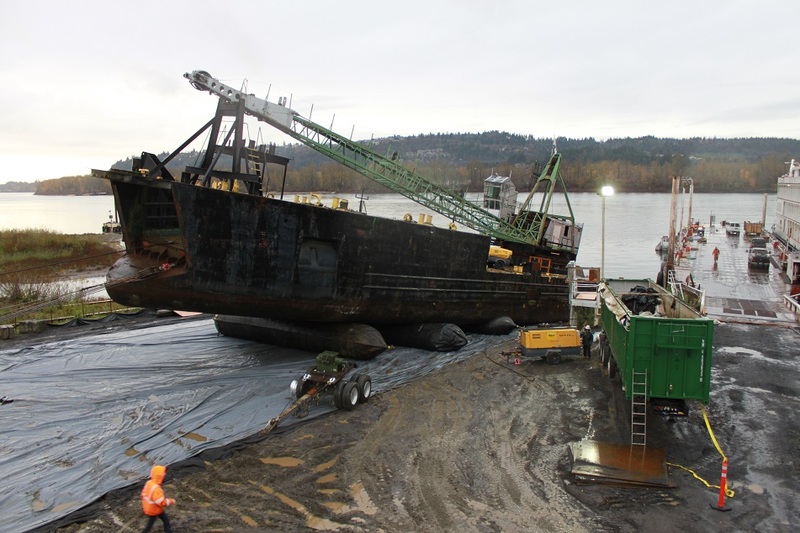 In August 2017, Global was awarded a contract by the Oregon Department of State Lands to remove a flotilla of 11 derelict commercial vessels, debris and dock structures from a state-owned leasehold on the Columbia River. The vessels were: a 300-ton dredging vessel; the River Queen, an 800-ton former car ferry; a 300-ton crane barge; three steel-hulled material barges; a steel tugboat; two wooden tugs; a motor vessel; and a sailboat. The site had been a problem for many years with a history of recurring “mystery spills”; Global had been contracted by the USCG and regulatory stakeholders to defuel sunken vessels on multiple occasions as they continued to sink at the site. The state terminated the leaseholder’s contract and ordered immediate removal of the vessels; at the time the project was put out to bid, three vessels at the site had already sunk and the remaining derelicts held the potential to release thousands of gallons of diesel, heavy fuel oil and other contaminants into the river. 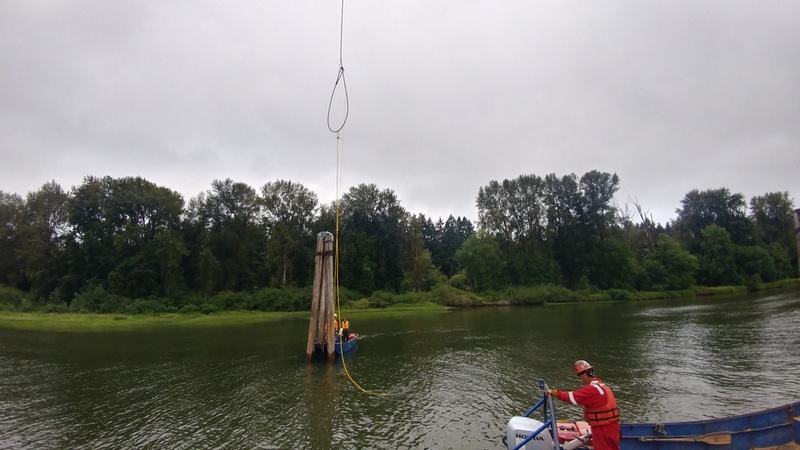 The US Coast Guard conducted an initial sweep of the vessels, removing the bulk hydrocarbons by defueling accessible tanks and removing hazardous fluids and solids, and an asbestos removal team began work on the known asbestos containing materials (ACM) in the River Queen. Global’s initial work included booming around the site to contain any leaking contaminants and debris; dive and environmental crews also completed full video surveys of all vessels above and below water, and documented their contents. The two wooden tugs and the motor vessel had sunk, and the other 8 were in various stages of disrepair; several vessels were silted in near the bank. Although the River Queen was at the top of the state’s priority list for removal because of her potential pollution risk, most of the other vessels were moored or sunk in place around the former car ferry; they would have to be removed before the River Queen could be accessed. Working steadily over several months, Global crews dewatered the floating vessels as needed to maintain buoyancy until they could be towed to a shipyard upstream for disposal; they also removed residual fuels, oils and other hazardous materials to mitigate the possibility of release until the vessels could be removed from the site. The decks of the floating vessels were cleared of several tons of debris including scrap metal, timbers, tires, broken construction equipment and camping trailers. A derrick barge was utilized for lifting and clamshelling operations to remove the sunken wooden vessels form the river bottom, and all clamshelled debris was placed onto materials barges. The barges were lined with plastic as a secondary containment, controlling contaminated water and waste. All derelict commercial vessels at the Goble site were under a Captain of the Port order, requiring a tow plan for release prior to movement. After a US Coast Guard tow plan was approved, each structurally sound floating vessel was towed upstream to a disused shipyard that Global had contracted for the dismantling process. Once at the shipyard, rollerbags were used to haul the vessels up the boat ramp onto shore in lieu of a crane; the rollerbags provided a more cost-effective and environmentally friendly approach. The vessels were rolled into a 60-mil HDPE-lined containment area. 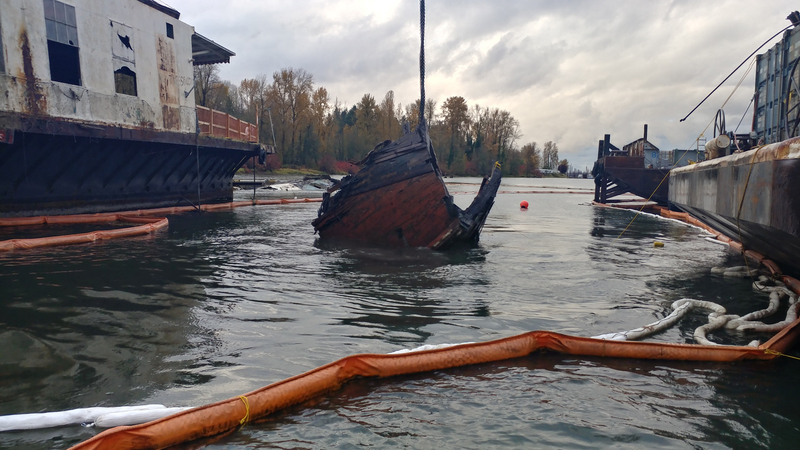 Crews conducted hazardous materials sampling before breaking the vessels down for recycling and proper disposal and ensuring worker safety was at the forefront. 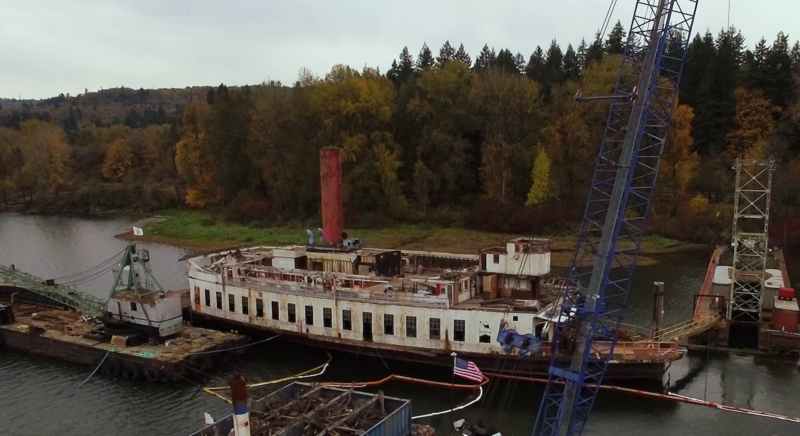 Moored at the center of the Goble site was the River Queen, a 215-foot long steel-hulled former car and passenger steamship ferry that had been turned into a floating restaurant and dance hall in the 1960s and had since fallen into serious disrepair. The vessel’s two stories of decks and pilot house were collapsing in on themselves; she was silted in and had developed a significant list. Because the River Queen was structurally unsound she couldn’t be towed upriver to the shipyard, so Global’s project managers, salvage master and naval architect developed a plan to remove the vessel’s topside structures and the cantilevered car deck at the Goble site, leaving just the steel hull. 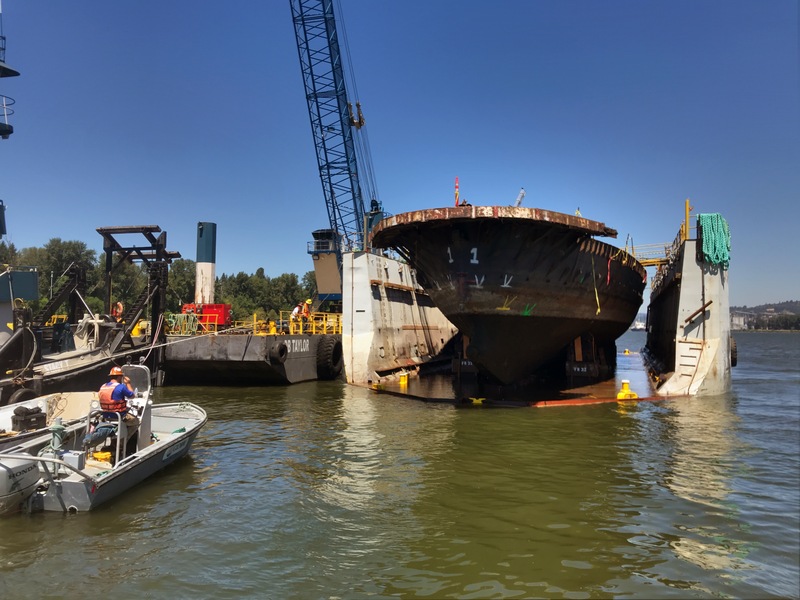 Once those elements were removed, the vessel’s hull could be placed into a floating drydock in the middle of the Columbia River and safely towed to the shipyard for final breaking. Lead paint and asbestos were removed from the River Queen by abatement crews on site; once the topside deck structures were cleared of contaminants they were systematically deconstructed, and the debris was loaded onto materials barges. By early summer 2018, the vessel’s hull was ready to be braced for structural stability, then maneuvered into the floating drydock and towed upriver. 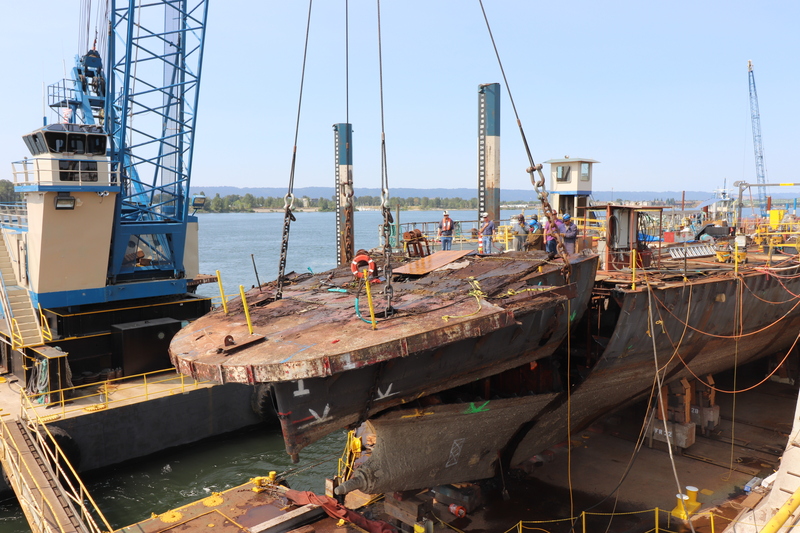 At the shipyard, abatement crews continued their work on the hull, followed by teams using wire saws and torches to cut the hull into portions that could be lifted out by crane. All the work on this project was performed with close adherence to local, state and federal laws and permitting, with concerned efforts to minimize environmental impact at both the project site and the breakdown shipyard. 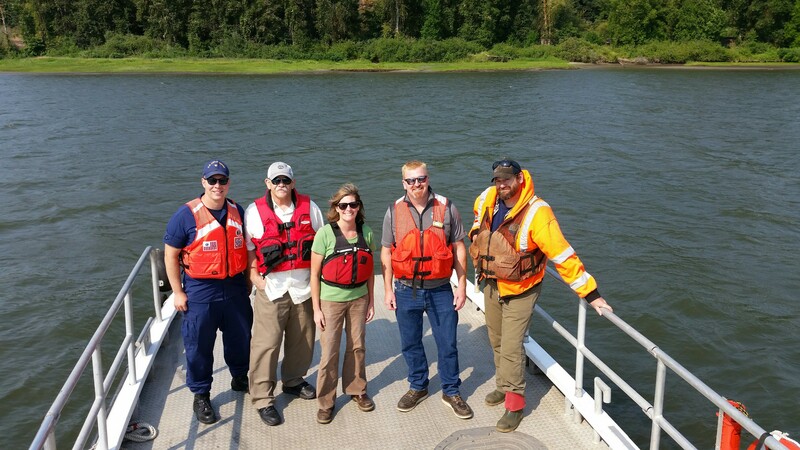 The success of the Goble project has relied on clear communication between the many parties involved, including subcontractors, state agencies, environmental permitting agencies and the US Coast Guard.